All great cars need upkeep and care. Get familiar with your Mercedes-Benz Ponton so performing routine maintenance and resolving minor issues becomes second nature. The factory workshop manuals are a great resource to help guide you through the maintenance and repair procedures you need to keep your car on the road, and in top condition. Consider seeking additional literature to enhance your education. Check your local library, neighborhood garage sales, and book stores for historic automotive reference material. Should your Ponton develop a mechanical problem on the road, you may not always have the correct tool to make a repair, but having a working knowledge of your vehicle will better prepare you to deal with any reasonable contingencies that arise. Join a special interest group and share your knowledge with others as you build your network. Establish contacts with specialized parts vendors so locating replacement parts is quick and easy. Pay close attention to routine maintenance to reduce the chance of an unexpected breakdown. 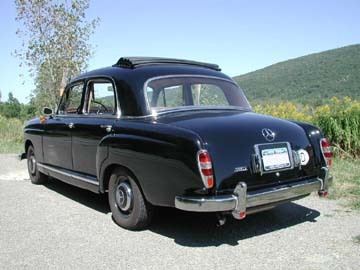 The technology used in the 1953-1962 Mercedes-Benz Pontons is uncomplicated by today's standards, making them attractive to owners who want to perform their own maintenance and repairs. In fact, it makes them a little too attractive. Read the owner's manual first. Sometimes, this important document is overlooked, but it contains a wealth of information written specifically for your car. Before an amateur automobile mechanic achieves the sense of accomplishment that results from successfully making repairs on their own car, they should assess their mechanical ability. Obtain the specialized tools and knowledge for working on systems which have become replaced by newer technology. These include ignition points, carburetors, mechanical fuel injection, drum brakes, and vacuum tube radios. Get yourself a set of metric wrenches, a timing light, and a dwell meter. One of the many ways an amateur mechanic can insure the job is performed correctly, and with relative ease, is by having the right tools on hand. The wrong tools can slow you down, and even botch the job. There are certain jobs that should not even be considered unless the right tool is available. For example, if the head gasket needs replacing, you should have a torque wrench. If there is an ignition timing problem, you stand a far better chance of fixing it, and keeping it fixed, if you use a timing light and dwell meter. Be sure to follow the procedures and specifications outlined in the factory workshop manuals. Making trial and error adjustments usually guarantees the problem will return. Learn about the unique engineering features, and optional equipment such as the recirculating ball steering, the low single pivot rear swing axle, the optional Hydrak automatic clutch, the Webasto sliding fabric sunroof and the canvas cabriolet roofs. Recognize the meaning of various Mercedes-Benz chassis numbers and model designations. Truth is a function of knowledge. The more knowledge you have, the closer to the truth you will be! Become familiar with the full range of Ponton models including the sedans, coupés, cabriolets, roadsters as well as the special bodied variants such as pick-ups, wagons, ambulances and hearses and discover which markets they were built for, and how they differ from one another. The Ponton series includes several four cylinder diesel models as well as other models with four and six cylinder gasoline engines, some including fuel injection. Pause for a moment and reflect on the various aspects of life during the 1953-1962 Ponton era. Many readers may not remember. Motorists used large, detailed roadmaps that were stored in the glove compartment for years without ever needing a re-charge. They did not have satellite navigation computers, internet, cell phones, mp3 players, airbags, electric windows, air conditioning, or cup holders. 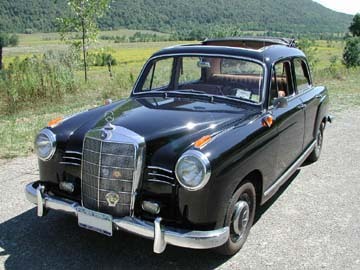 Automotive technology was less complicated, and the Mercedes-Benz Pontons reflect that period in every sense. 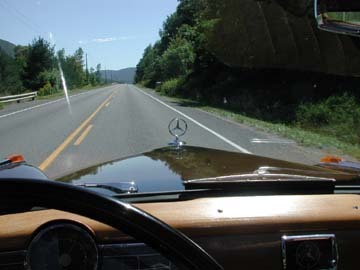 Find a country road, roll down the windows, and enjoy the visceral sensations of driving a durable, antique Mercedes-Benz that you learned to maintain. For it is the journey, not the destination, that is most enjoyable.